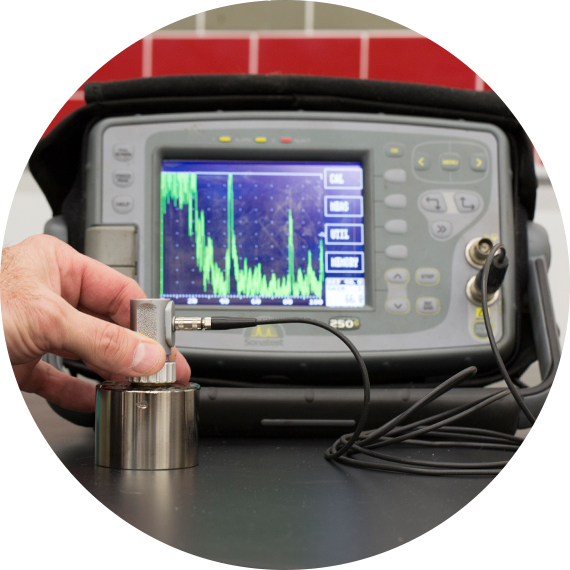 Ultrasonic testing is used to find internal defects or flaws within your material. In our testing, ultrasonic waves are transmitted to the material through a couplant. The signals that are received back determine whether an obstruction or void is present within the material. One advantage of ultrasonic testing is that it can be done at your facility. Our certified Level 2 technicians carry our portable testing units to your location to conduct non-destructive tests on your material. A Sonatest 250 is used to identify internal voids or other subsurface irregularities. We perform testing to a variety of common international and customer standards. Since results are immediate, you’ll know how to respond to any flaws quickly.